Chronic hunger affects hundreds of millions of people worldwide but it is most deeply entrenched in Africa. In 2004, the United Nations Food and Agriculture Organization (FAO) estimated that the number of chronically malnourished in the world had increased to 854 million, with the situation in sub-Saharan Africa being the most dire: the absolute number of hungry people increased from 169 million to 212 million. This grave situation was further worsened by an 83 percent increase in global food prices between 2005 and 2008. Provisional FAO estimates show that rising prices have plunged an additional 75 million people globally below the hunger threshold, of which 24 million are in sub-Saharan Africa. A crisis of this proportion raises major questions about industrial agriculture and how best to address the needs of the hungry. The global food crisis requires intervention and a paradigm shift that recognizes agriculture as fundamental to the well-being of all people, both in terms of access to safe and nutritious food and as the foundation of healthy communities, cultures, and the environment. Unfortunately, the 2008 food crisis—especially the widespread hunger and poverty in Africa—is being used to make the case for addressing hunger by increasing agricultural production through technical solutions such as genetically engineered (GE) crops. 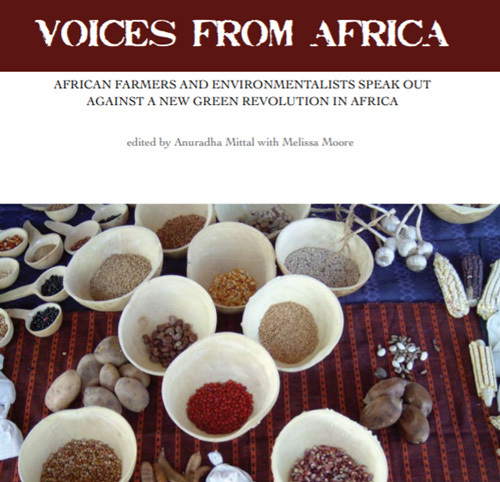 Nowhere in the process of crafting solutions are the voices and experiences of Africans, especially African farmers, included.